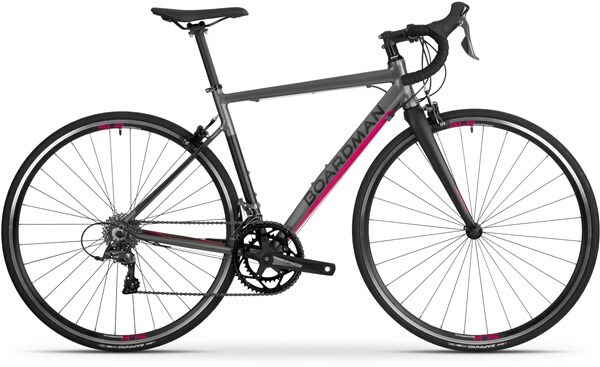 The Boardman SLR 8.6 Claris Mens Road Bike is a fantastic new entry level road bike from Boardman. The all-new lightweight 7005 alloy frame shares its DNA with the top of their Series 9 range of bikes and as such you get aero-inspired tubes and endurance geometry that will enhance your ride experience. Full carbon forks are also weight saving with the added advantage of reducing vibrations from the road surface making this a brilliant option for riders keen to get into cycling and slowly increase the miles they ride. The 16 speed Shimano gear system is reliable, low maintenance and gives you a comprehensive range of gears for tackling all terrains. Combining a great frame with reliable components the Boardman SLR 8.6 Road Bike give fantastic value for money. If you fancy a few upgrades on this bike, trade up to SLR 8.9C for a Full carbon frame, 20-speed Tiagra groupset and Vittoria Rubino tyres. Fork: Full carbon blades and steerer, 1 1/8"
Pedals: Toe strap road, 9/16"